↑ National Geospatial Intelligence Agency (2014) p. 266. ↑ 2.0 2.1 2.2 George Weber. "The Andamanese: Chapter 8: The Tribes". pp. part 6. The Sentineli. Archived from the original on 20 May 2013. ↑ "﻿District Census Handbook: Andaman & Nicobar Islands﻿". Census of India: 156. 2011. http://censusindia.gov.in/2011census/dchb/3500_PART_B_DCHB_ANDAMAN%20&%20NICOBAR%20ISLANDS.pdf#page=177. เรียกข้อมูลเมื่อ 1 August 2015. ↑ "Earth from Space: North Sentinel Island". European Space Agency. 29 April 2005. สืบค้นเมื่อ 1 August 2015. 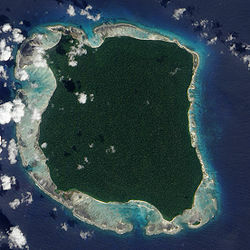 The 72-square-kilometre-area North Sentinel Island is home to the fiercely independent Sentinelese tribe, known to reject any contact with outsiders. The Indian government carried out its 2001 census of the Island from a distance, counting a total population of 21 males and 18 females, although other estimates range higher, to a maximum of 500. ↑ Weber, George. "The Andamanese: Chapter 2: They Call it Home". Archived from the original on 2 April 2013. ↑ "The Island Tribe Hostile To Outsiders Face Survival Threat". สืบค้นเมื่อ 2015-07-24. หน้านี้แก้ไขล่าสุดเมื่อวันที่ 26 พฤศจิกายน 2561 เวลา 11:50 น.